Compacting Ejector Button! The Weston Burger EXPress With Patty Ejector will allow you to create perfectly sized, pressed, and portioned burgers any time with your own ground meats! Making your burgers yourself also allows you to season them exactly to your taste! Perfectly formed burgers eliminate 'fat' burgers that are undercooked in the center, and 'thin' burgers that fall apart when you try and flip them. 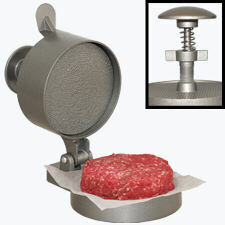 Also great for sausage patties, turkey burgers & crab cakes. Measures 5.5 X 7 X 2"